Garmin GPSMAP 172c is a 12 parallel channel, EGNOS-enabled GPS receiver with an extra large display that makes keeping an eye on your map easy. has been designed to be a compact unit. Since space is at a premium on most boats, Garmin have maximised the display on this handheld or fixed chartplotter while keeping overall size slim and compact. Garmin GPSMAP 172C has been discontinued. The Garmin GPSMAP 172c is a 12 parallel channel, EGNOS-enabled GPS receiver with an extra large display that makes keeping an eye on your map easy. has been designed to be a compact unit. 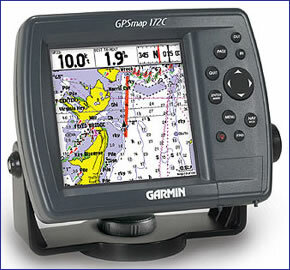 Since space is at a premium on most boats, Garmin have maximised the display on this handheld or fixed chartplotter while keeping overall size slim and compact. The bright 16-colour transreflective screen of the Garmin GPSMAP 172c, you'll get a clear picture of where you are on the map. The Garmin GPSMAP 172c offers excellent built-in maps, and they accept data from pre-programmed data cards or MapSource CD-Roms with BlueChart marine cartography. The Garmin GPSMAP 172c includes various alarms that can be activated to warn of the following: Anchor drag, arrival, off-course, proximity waypoint, shallow and deep water. The Garmin GPSMAP 172c also includes Garmin's exclusive TracBack technology which allows you to mark your campsite, go trekking all day, and then follow the electronic "breadcrumb trial" back to camp in time for dinner.